The Near field communication(NFC) is a set of standards for Smartphone’s and similar devices to establish radio communication with each other by touching them together or bringing them into close proximity, usually no more than a few centimeters. Support II2, SPI and HSU (High Speed UART). -Mifare 1k, 4k, Ultralight, and DesFire cards. -ISO/IEC 14443-4 cards such as CD97BX, CD light, DesFire, P5CN072 (SMX). -Innovision Jewel cards such as IRT5001 card. -FeliCa cards such as RCS_860 and RCS_854. Plug and play, Arduino compatible. Built in PCB Antenna, with 5cm~7cm communication distance. On-board level shifter, Standard 5V TTL for I2C and UART, 3.3V TTL SPI. Work as 1443-A card or a virtual card. Support NFC with Android phone. It is used in RF applications. 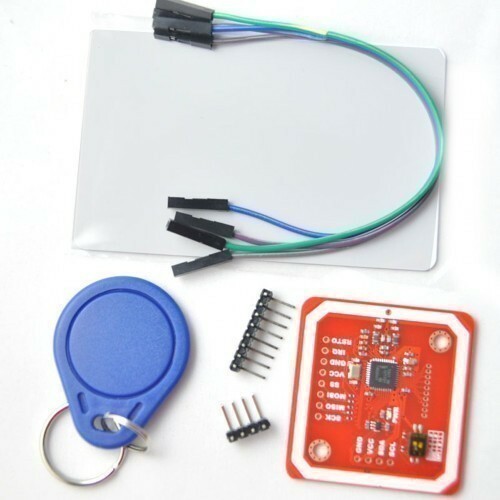 RF identification based electronic projects. 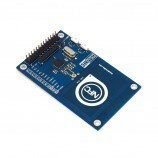 Also Searched as:pn532 nfc rfid module v3, itead pn532 nfc module, itead pn532 nfc module arduino, pn532 nfc datasheet.